Several residents of Thornage Hall, a Norfolk based Residential & Day Care Farm that works with people with special needs, were joined by a group of young people from the nearby Aylsham High School to rehearse and perform this specially devised adaption of Shakespeare’s ‘Macbeth’ at their 2014 Autumn Fayre. In addition to the challenge, enjoyment and opportunity to develop both scriptwriting and performing skills, the project had the further aim of raising the awareness of the young people, and others in the locality, of the work of Thornage Hall and the needs and potential of its residents. Both the Head Teacher and the Director of Thornage Hall confirmed how positively their respective groups had ‘gelled’ over their week together; particularly how the initial ‘fears’ of the pupils about the setting and how they would ‘cope’ had been overcome; equally how the Thornage Hall Residents had responded so competently and enthusiastically to ‘going on stage’ and playing a range of both small speaking parts and those of soldiers, servants and witches etc. This Project was linked to the CMMF through Jenny Manser (Lepley) who, as Chairperson of the Aylsham Community Care Centre, did a remarkable job of ‘fixing everything and everyone’ – especially in persuading the Head Teacher to allow the pupils to spend a whole week at Thornage Hall and in somehow coming up with a ‘press gang’ to clear and convert a disused barn into a theatre – complete with tiered seating! ‘Macbeth’ was therefore staged in Thornage Hall’s new ‘Barn Theatre’ and this resource, along with the results of their involvement, has led to the formation of a residents Drama Group – which has been an unexpected, but obviously welcomed longer term outcome of CMMF’s funding. Having now established a link with Thornage Hall and its residents, the pupils at Aylsham High School will continue to have access to the ‘Barn Theatre’ – with further joint performances also being envisaged – as noted below. 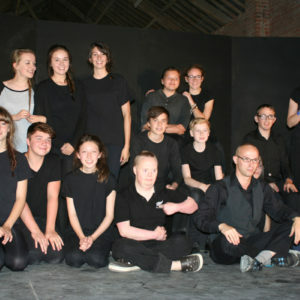 And – the ‘performing arts’ link between these two organisations that Jenny was able to develop through this CMMF Project, resulted in a further joint production, similarly in the Barn Theatre at Thornage, the following September – with this being a specially adapted version of ‘A Midsummer Night’s Dream’. Jenny reported an even larger audience of 250 for this 2015 performance – and standing ovations. 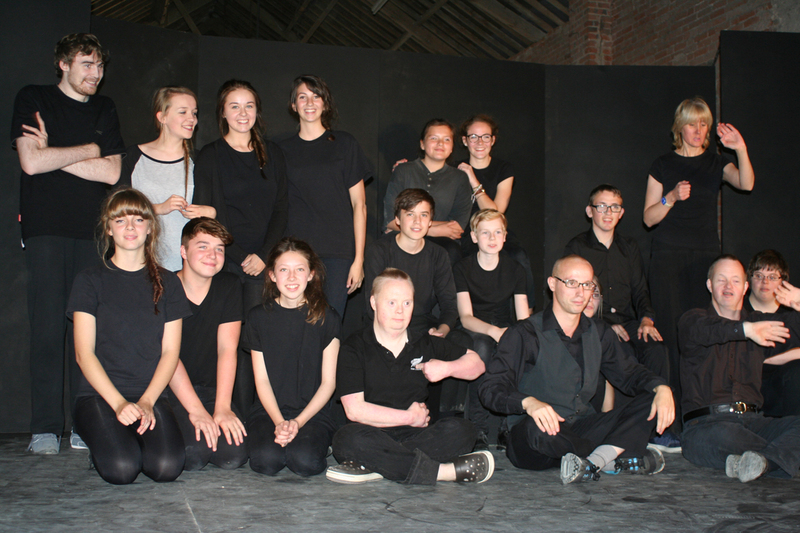 So – a longer term gain and benefit emanating from the CMMF’s original funding – plus, if the envisaged plans for a further CMMF Grant go ahead, the further potential of developing a Young People’s Drama Group in the village of Aylsham. The above photograph of the ‘Macbeth’ cast is copyright to the CMMF and is shown with the agreement of Thornage Hall and the Aylsham High School, Norfolk.